For some time now, Hollywood has been “going through the motions” of revisiting old feature films and “updating” for a modern audience; presenting them as remakes during this current age of cinematic endeavors. However, these remakes are generally not held in high regard; finding many to be a somewhat “easy target” for criticism from both critics and average moviegoers alike, with most denouncing them for Hollywood’s lack of creativity. In conjunction with that, remakes are inevitably compared to its original counterpart film and (in most cases) are dismissed as “lesser” or “inferior” iterations. In hindsight, this idea of filmmaking is considered a “double edge” sword, with providing better cinematic nuances to a story from older movie (i.e. better acting, enhanced visual effects, richer story, etc.) of which was not available at original’s conception. Such popular remake movies (on this bases) includes 2001’s Ocean Eleven (original done in 1960), 2006’s The Departed (original done in 2002 under the title Internal Affairs), 2010’s True Grit (original done in 1969), and many others. However, the “flip side” of remakes, despite having modern advances in moviemaking, that some just simply lack of originality / creativity, with Hollywood completely missing the “mark”; merely trying to “capitalize” the name alone. Such perfect example of these movies includes 2010’s Clash of the Titans (original done in 1981), 2011’s Conan the Barbarian (original done in 1982), 2010’s Karate Kid (original done in 1984), and many (and I do mean many) others. Now, Warner Bros. Pictures (in association with Metro-Goldwyn-Mayer) and actor Bradley Cooper (making his directorial debut) present the latest Hollywood remake feature with the 2018 film A Star is Born. Does this movie “aim” to be one of the better cinematic remakes of late or is it another failed “washed out” idea of a motion picture from today’s Hollywood? Jackson “Jack” Maine (Bradley Cooper) is a well-established and prominent country singer/ songwriter who’s infamously known for his heavy alcohol drinking and leading a “wild” celebrity lifestyle. One night, following one of his concert performances, Jack stops at a random nightclub in search for alcohol, unaware that’s it a gay bar in the middle of a drag queen show. Jack is even further surprised when he sees a young woman named Ally (Lady Gaga) performing as part of the show; wowing the crowd with her mesmerizing singing voice. Impressed her vocal talents, Jack convinces Ally to have a drink with him and the pair quickly forms a connection both as musicians and romantically. Assuming that their chance encounter was just a “one night” stand preamble, Ally is shocked when Jack invites her to his next concert performance, with the famed country singer coaxing the unknown singer hopeful to perform one of her own songs with him on stage, which she does to thunderous applause from the attending crowd. Before she knows it, Ally is skyrocketing to music superstardom, while her relationship with Jack blooms into a full-blown romance and much more. However, just as everything is on the “up and up” for Ally, Jack finds that the wear and tear of his “rock and roll” lifestyle is finally catching up to him; clashing with his owns personal demons and the realization that his own time in the spotlight might be over soon. Much like what I said above, “remakes” have become all the rage in current era of Hollywood; though this notion has been going on for quite some time in the age of movies and films. Whatever you call them (i.e. remakes, reboots, direct sequels, spiritual sequels, or just simple a remake in name only), these cinematic ventures often try to “revitalize” the movie magic that it was once had in a way to speak to a modern viewing audience. Nowadays, especially with the plethora of theatrical movies coming every year, Hollywood remakes seems to be “hit or miss”, with the latter being the more prominent one of the two. Personally, much like what I mentioned above, I believe that movie studios are just simply trying to capitalize the nostalgia popularity, especially when you look at all the recent “belated movie sequels” that have been coming out (i.e. Zoolander 2, My Big Fat Greek Wedding 2, Mamma Mia: Here We Go Again, etc.). Additionally, current standalone remakes, more often that not, miss their mark and just end up being bad imitations of their original, with majority favoring updated movie technology and “who’s playing who” in the movie than cultivating a wholesome / cohesive feature. However, some recent Hollywood remakes I’ve personally enjoyed, with some examples being 1983’s Scarface, 2006’s Casino Royale, 2016’s The Magnificent Seven, and 2017’s Beauty and the Beast. Thus, the current trend of remaking / rebooting / revamping Hollywood movies has a certain duality to it all; one that has alluring fascination as well as some criticism over its original source material. Naturally, the brings me around to talking about the 2018 film A Star is Born. If you didn’t know, this movie is actually the fourth cinematic iteration of A Star is Born, with the original one being released back in 1937 (starring actor Fredric March and actress Janet Gaynor), which is then followed by the 1954 musical (starring actor James Mason and actress Judy Garland) and then the 1976 rock musical (starring actor Kris Kristofferson and Barbara Streisand). Unfortunately, while I’ve heard of A Star is Born (mostly the 1976 version of the movie), I actually haven’t sat down and watched any iteration of the cinematic tale. I know…. I’m a terrible. Thus, my review for the 2018 version of A Star is Born is gonna be strictly on the movie and not so much on the comparison to the past film iterations. So…moving forward….it might come to you as a shock, but I really didn’t hear much about this movie (via the internet) …. that was until I saw the trailer for the feature and was completely blown away by it. Maybe it was for the simple fact that Bradley Cooper and Lady Gaga were doing a movie together (an odd-pairing at first sight, but definitely an interesting one) or maybe it was the fact that Cooper was directing the feature or maybe even that Lady Gaga was gonna be singing throughout the film. Regardless, I was definitely super curious to see A Star is Born and went to see it in theaters, hoping for a great dramatic feature film. What did I think of it? Well, it was everything I was hoping for and then some. While the movie does have a few areas that stumbles, majority of the film succeeds in being a fantastic character drama, finding A Star is Born electrifying and cinematically moving, especially in its two primary leads. Yes, it’s a remake, but the movie is definitely one of the better (maybe one of the best) remakes of late. As stated above, A Star is Born is directed actor Bradley Cooper, who makes his directorial debut with the movie. Getting Cooper to the director’s chair for a project like this wasn’t an easy feat as this whole remake endeavor first began back in 2011, with filmmaker director / actor Clint Eastwood attached to helm the feature as well as famed musician singer Beyoncé for the lead role. However, the project took some time to get its feet “off the ground”, with both Eastwood and Beyoncé leaving project and various other directors and actors / actress being “interested” in the movie. However, the role of directing (and eventually being offered the lead male role) was given to Bradley Cooper; a daunting task for sure, especially when operating as both actor / director in a feature film. To his credit, Cooper does quite an impressive job as a first-time director, with his direction for A Star is Born being more fluid and enticingly gripping than what I’ve seeing from other directorial debut endeavors (i.e. less art-house-ish). 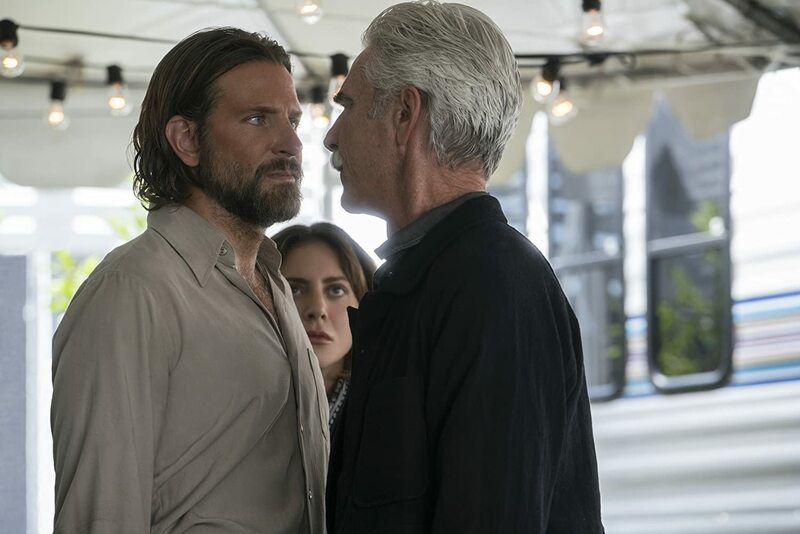 In truth, Cooper takes a more performance-driven storytelling approach with the movie, focusing a lot of movie’s runtime squarely on the “life and times” of Jackson Maine and Ally, displaying their own personal triumphs and dramatic downturns that befall them. The film’s script, which was penned by Cooper (dang…. directing, acting, and screenplay writing. He really is doing a “round robin” in this movie) along with Eric Roth and Will Fetters, speaks to that notion as well, with a bulk of the script revolving around Jack and Ally’s journey (both on their personal individual storylines and together as a couple). However, what makes the movie standout is that, despite having a narrative focusing on a tried-and-true story (i.e. a troubled older musician warming up to a younger up and comer hopeful), the movie seems fresh enough to make feel that it doesn’t feel like a recycled feature from its past iterations. Yes, it’s still keeps the mains structure (and plenty of melodrama), but the movie is still grounded in human relationship as well as its musical songs (more on that below) in a way that’s both compelling and cinematically entertaining. It also interesting to note that in both Cooper’s direction and in the film’s script that the movie shows an honest portrayal of its two main characters wrestling with their emotional struggles and toxic lifestyles in order to provide enough context for the feature, which ultimately works within the movie’s favor. A Star is Born also benefits from having a solid technical presentation, making the movie “look and feel” great from start to finish. The most notable pieces of the film are (without a doubt) the film’s concert musical numbers, displaying some impressive work from both Cooper (as director) as well as from movie’s cinematographer Matthew Libatique, who photographically projects the live shows in a way that’s both truly cinematically captivating and striking to watch within their composition. The technical achievements in the film is also made me effective within the stylish approach that movie offers in the portrait of its characters various experiences throughout by the means of usage of closeups, lightning, and unique sound designs. Thus, the talents by the entire make-up department and sound-mixing team deserve credit for their efforts on the film. Additionally, the costume designs by Erin Benach, the production designs by Karen Murphy, and the set decorations by Ryan Watson are top-notch as well and certainly do add a certain “cinematic” nuance to the film’s proceeding as background flourishes. 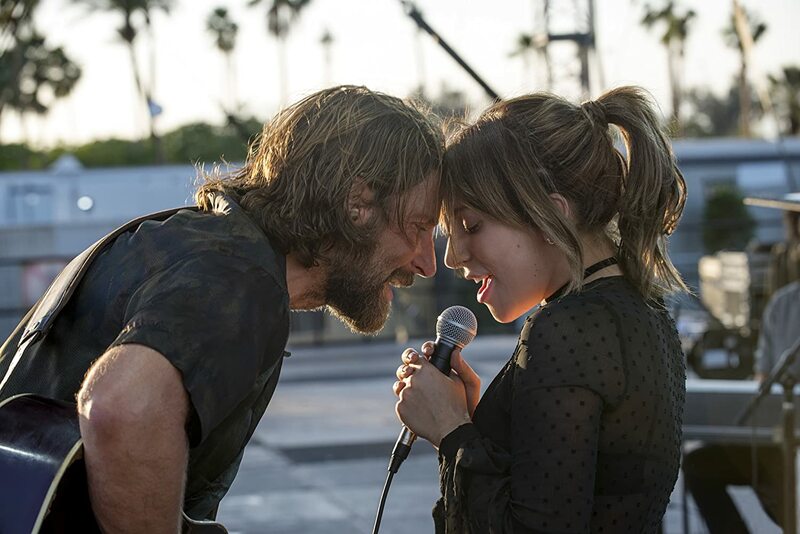 Of course, the main highlight of A Star is Born is the actually songs sung in the movie, which are performed by both Bradley Cooper and Lady Gaga, which are quite impressive to behold with each one delivering some powerful and melodic songs in their respective vocals talents and in their characters. While all the songs in the movie are great (already downloaded the soundtrack for the film via iTunes), some of my personal favorite songs from the film are “Maybe It’s Time”, “Shallow”, and “I’ll Never Love Again”, with these three songs demonstrating the vocal talents by both Cooper and Gaga beautifully. Hope that one of these songs gets nominated during the award season (as I’m sure it will be). There are a few problems that I had with A Star is Born, which does hold the movie back slightly with some problematic criticism. The first and foremost one is the fact that the movie’s overextended its runtime. Clocking in at around 135 minutes (i.e. two hours and fifteen minutes), the movie certainly does feel long, despite being engrossed in the musical romantic tale of Jack and Ally. It’s kind of a “double edge” sword motif that strikes a problematic chord within the movie as the film seems quite bloated in its runtime and could’ve been easily trimmed down a good fifteen minutes to have a nice two-hour film. However, the other side of this is the simple fact that there’s more to story (as a whole) that could’ve been told and expanded upon. In truth, with the film being more character performance driven than narrative driven, A Star is Born works better as a romantic drama than a poignant and cautionary tale of ambiguous cycle of fame and success in show business. While the first act, which could’ve been trimmed slightly down, makes a strong impression in introducing the two characters of Jack and Ally, the third act showcases their downward spiral in their relationship and the consequences that they must live with. The second act, however, leaves much to be desired, which much of the compelling character-driven narrative onto more of Ally’s “fast track” rise to superstardom, while Jack begins to fade from the spotlight around her. It’s an interesting thing to juxtapose those two different paths and see how each one reacts to the other’s dilemma, but the movie just simples doesn’t have much to say in the way of discussing the ambiguous nature of fame / success in the world of showbiz, which is disappointing because has the opportunity to display the “highs and lows” of stardom of making it (and possibly being a “sell out” in today’s stardom world of music. Given the fact that this is Cooper’s first time directing a feature length film, he did not have the chance to cover the area (more interest in the characters than plot substance) or maybe that it was the “in the cards” when the film’s script was been written. Regardless, given the very nature of the film’s storyline, it’s a shame that this 2018 version of A Star is Born doesn’t delve into the fickle nature of “making it big” today’s world of show business. There’s some material presented that sort of glimpse that world, but this area could’ve easily been expanded upon and further examined, especially in a character study film like this. Another problem (mostly a minor one) I had with the movie is how “choppy” it is at various points. Of course, editing some scenes and ending then rather abruptly or in an unconventional manner can work inside a film (if done right and done in a manner that “jives” with scene being told). That being said, the film does it more often than more, with quickly abrupt cut sequences that seems more amateur than from a professional theatrical movie. This can be from either Cooper’s first time directing a full-length feature or simple to the fact that film editor Jay Cassidy does a messy editing job when crafting A Star is Born’s final cut. Again, this is mostly a minor problem I saw with the movie; more of the movie critic in me than the average moviegoer noticing it. With the film being considered a character-driven movie, A Star is Born benefits from having such a strong and commanding leads, finding both actor Bradley Cooper and famed pop singer musician Lady Gaga (or her real name of Stefani Joanne Angelina Germanott) incredible in their respective roles of country rock singer Jackson “Jack” Maine and rising star hopeful Ally. Cooper, known for his roles in Silver Linings Playbook, American Sniper, and American Hustle, delivers an emotionally rich performance in Jack, providing enough nuances to make him (the character) charismatic and almost sympathetic throughout the film; a role that could’ve been easily “pandered” to the classic “behind the music” rock musician (i.e. creepy, odd, and self-entitled). Still, there’s plenty of depth into the character of Jackson Maine, looking at his destructive nature that swirls around all him. Plus, I can’t forget to mention that Cooper’s singing is actually pretty good, especially coming from an individual who doesn’t have background as one. Personally, I thought he was great in the role and, while I still think his best role was in his portrayal of Chris Kyle in American Sniper, Cooper’s Jackson Maine is truly captivating (as a cinematic character) and definitely credited towards the actor’s talents, especially since he both acted (in one of the main leads) as well as directing A Star is Born. As for Gaga, who has appeared (acting-wise) in such endeavors like American Horror Story, Sin City: A Dame to Kill For, and Machete Kills, truly does shine in the movie…. maybe a bit more than Cooper’s Jack (much like how the movie’s narrative plays out). She definitely can “holder her own” against Cooper, who’s a seasoned actor in comparison, and truly does make for a compelling character in portrayal of Ally, a young aspiring singer who gets swept up in Jackson Maine’s world and (eventually) moves up her own personal latter of fame and success. 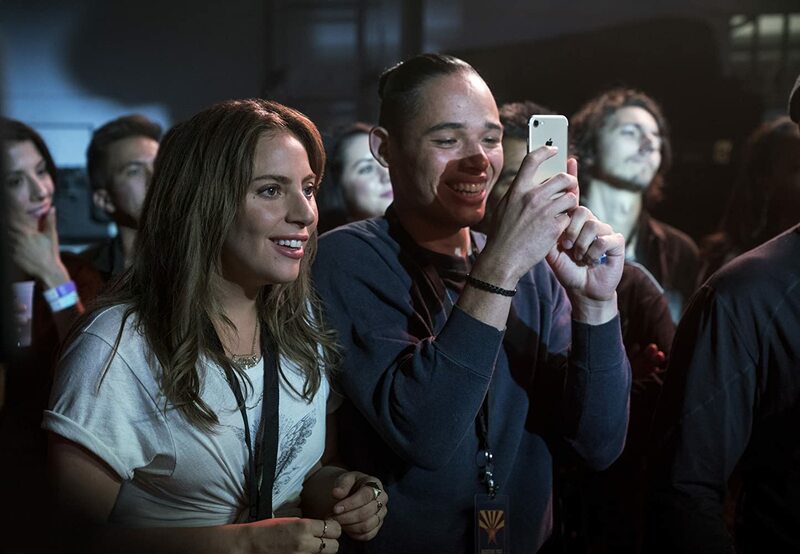 While I mentioned above that there could’ve been more substance in Ally’s “rise to stardom”, but its actually Gaga’s acting talents that make the character very appealing. Plus, it goes without saying that her singing parts in the film are truly the most memorable moments in the movie (as I mentioned the songs “Shallows” and “I’ll Never Love Again”) and it’s a testament in how it shows how powerful (and strong) Gaga’s vocal talents are. In a nutshell, Lady Gaga truly does wonders in making Ally a likeable main protagonist character that real does make “the star” in A Star is Born. Here’s to hoping that Gaga (as well as Cooper) get some nominations in the performances in the movie at this upcoming award season. Given the fact that the relationship between Jack and Ally is the true emotional core of A Star is Born, it’s almost crucial that the film’s two main leads have an easy-going chemistry with each other. Luckily, both Cooper and Gaga share that chemistry (and in spades), with each one giving a natural on-screen romance that really does speak volumes in the movie, making Jack and Ally’s relationship believable and dramatically heartfelt and never feeling forced in any way. With much of the movie focusing on Cooper’s Jack and Lady Gaga’s Ally, the rest of the cast is in more supportive roles that are in service to those two main leads; presenting themselves (i.e. the characters) in order to had a more well-roundness to Jack and Ally. This includes actor Sam Elliot (The Hero and The Big Lebowski) as Jack’s older brother / manager Bobby Maine, stand-up comedian / actor Dave Chappelle (Chappelle’s Show and Robin Hood: Men in Tights) as Jack’s old friend / retired musician George “Noodles” Stone, actor Andrew Dice Clay (Entourage and Blue Jasmine) as Ally’s father Lorenzo, actor Anthony Ramos (She’s Gotta Have It and Godzilla: King of the Monsters) as Ally’s close friend Ramone, and actor Rafi Gavron (Snitch and The Cold Light of Day) as Ally’s producing manager Rez. Again, all of these actors deliver fine acting performances in their respective roles and, while they themselves (their characters) may not be fully developed, they do bolster the character personas of both Jackson Maine and Ally throughout the movie. Plus, I do have to say that while actor Sam Elliot delivers the best supporting role in the movie, the biggest surprise (at least to me) is seeing Chappelle acting again, especially after his very long hiatus away from the media spotlight. Additionally, there are a few small / cameo appearances, including actor Greg Grunberg (Heroes and Star Wars: The Force Awakens) as Jack’s driver, actor Michael Harney (Orange is the New Black and Weeds) as one of Lorenzo’s limo drivers Wolfie, and Lukas Nelson & Promise of the Real (aka POTR, a country rock band) that makes up Jackson Maine’s band in the film, while songwriter Marlon Williams, folk / rock singer Brandi Carlile, and singer Halsey, actor Alec Baldwin, and television director Don Roy King playing themselves in the movie. 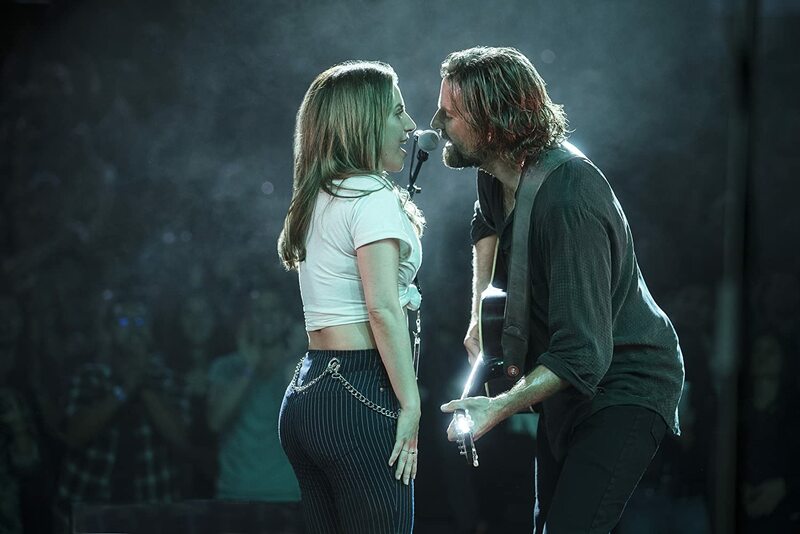 Fame, love, success, and unbridled musical vocals play an instrumental role in the romantic courtship of country rock star Jackson Maine and hopeful musician Ally in the movie A Star is Born. Director Bradley Cooper, making his directorial debut with this feature, sees the classic story (of which began back in 1937, and gives the narrative a “modern twist”, displaying the right amount of its own memorable / original moments that makes this 2018 feature stand on its own merits. While there are few problematic bumps along the way (its lack of substance in the second act and the feature’s lengthy runtime), the movie succeeds in being truly memorable (despite being a remake endeavor), standing out with its incredible two leads (and their chemistry), a heartfelt drama story, a solid script, and some memorable musical concert tunes / songs. Personally, I really liked this movie. Like I said, some areas could’ve been expanded upon, but majority of the film was highly enjoyable (in both being a moviegoer and a movie critic). 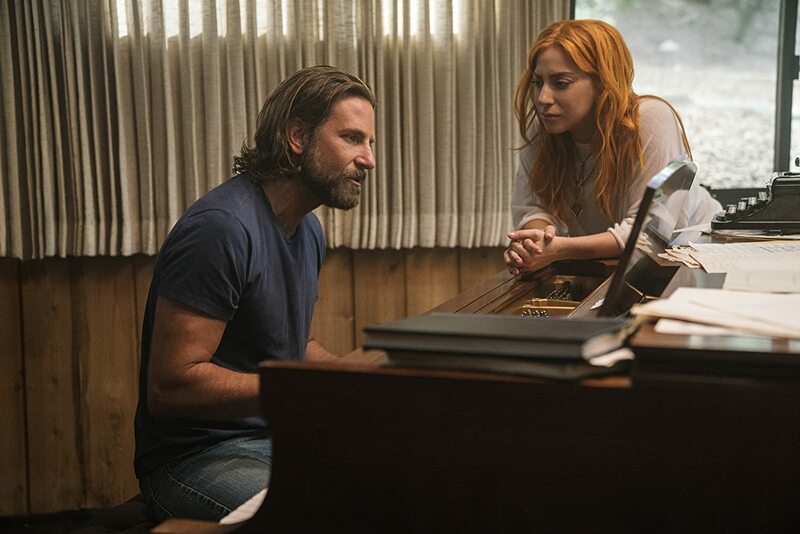 Plus, I loved Cooper and Lady Gaga in the movie, with each one given stellar performance (hopefully to be nominated at this upcoming award season). Suffice to say that the inherit hype surrounding this movie is real, which makes my recommendation for an extremely solid “highly recommended” one, it’s a movie to see and get excited about and doesn’t disappointment in being a moving and entertaining feature. Thus, A Star is Born is great and fantastic feature that has some fine performances, a compelling character-based narrative, and a sublime musical / lyrical soundtrack. Here’s to hoping that we see more of Lady Gaga in front of the cinematic lens and Bradley Cooper in the director’s chair in the foreseeable future. For now, while some movies out there don’t live up to their own hype and can’t match the moviegoers’ expectations, A Star is Born certainly does masterfully; demonstrating the classic phrase of “shining, not burning”.